I think Barbara Luderowski and Michael Olijnyk should write a business book. I know they would laugh at the thought, but I’m being sincere. For the past couple of weeks I’ve been immersed in watching and transcribing individual oral history videos of Barbara and Michael in which they discuss their early childhoods, their first experiences with art, and eventually the origins and the early years of the Mattress Factory. They each speak eloquently about wanting to create a place that was intellectually stimulating and supportive of artists, a place that would incorporate all artistic disciplines by focusing on installation. There was never a master plan. The place grew “organically” (as Michael described) – both physically and organizationally. They slowly purchased and renovated nearby buildings for gallery and artist apartment space. They developed education programs, added a café, and began developing digital media initiatives. They grew by capitalizing on opportunity. They tried to make intelligent decisions. They learned to avoid easy money when it did not align with their core mission. They took chances. During one interview, Barbara recounts how the museum’s relationship with James Turrell began. He was already a well-established artist by the early 1980s, but Barbara and Michael approached him anyway, drove to New York City and boldly invited him to the museum while sharing a cab ride. The museum grew by experimenting. This is what artists do. But normally they do it in the privacy of their studios. 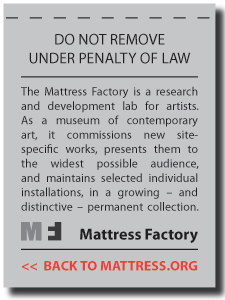 Here, the Mattress Factory does it publicly as an organization in a very transparent way. They’re willing to try to new things. Good ideas are acted upon more quickly in part because there are fewer barriers. “Go for it!” Barbara would say. It’s no wonder then that the museum was the first in the U.S. to utilize QR code technology as a visitor engagement tool in its galleries. Jeffrey then shared the easy-to-use and free technology in a September, 2009 blog. Or that the Mattress Factory was the first museum in the country to offer an entirely paperless “green” membership. These are just two examples of staff-generated ideas that were acted upon and which now serve to distinguish the museum. This is not the world I had come from. Originally, I thought I would write this final blog about how the Mattress Factory ruined me. How my first few weeks here felt like a recovery program from the years I had spent at an old, large, cultural not-for-profit with a traditional top-down management style. In January when I first spoke with Jeffrey and talked myself into working for him (I am sure that’s what happened), I remember telling him that I was “ready for lean and mean.” And that’s exactly what I got. The Mattress Factory operates with just 12 full-time employees – a talented, creative, multi-tasking, collaborative group of people. Many are artists themselves. The organizational structure is extremely horizontal. Of course everyone knows that the buck stops with Barbara and Michael, but otherwise there is no hierarchy. Bureaucracy is almost nonexistent. The fundamental characteristics of the museum struck me right away. Frankly, it took some getting used to. And now I’m ruined. At least that’s what I was going to write about. But then I learned that the museum has always been this way. It’s how the place started, and in that respect, not much has changed. From a business perspective, I think these are all reasons why the museum has been so successful. People want to be a part of something exciting. The uniqueness of the work and the process of discovery – for the artist, the museum go-er, and for the organization itself – are the museum’s most compelling features. You never know what you’re going to get, but you know it’s going to be something you’ve never experienced before. One last quick story. As the last vestiges of the February snowpocalypse began to recede, Michael popped in on his usual rounds and asked, “Has anyone noticed that big mound of grey snow on the corner?” Snow was all anyone had been looking at for months, but no one in the office seemed to know what he was talking about. Something was brewing. “I think we should do something with it,” he said. Over the course of the next two hours Michael made art out of the last remaining, stubborn, grit-covered pile of snow in the neighborhood, conveniently located at the well-traveled intersection near the Annex Gallery. An eternal optimist with a little streak of devilishness, Michael wanted to send a message of hope to the community that Spring was on its way. As my time at the museum comes to an end, these are the memories I will take with me. And I leave reassured that a vibrant arts organization can thrive – not by mimicking the for-profit business world and organizational structures but by capitalizing on the creativity and flexibility that come naturally to artists. Be bold. Take risks. It's only May, but things are really starting to heat up here at the Mattress Factory. For example, we're opening two exhibitions this coming Saturday evening at 7:00 PM. The first is the 14th installment of the Gestures Exhibition Series. Guest-curated again by the incomparable Katherine Talcott, Gestures 14 features new work from Danny Bracken, Dee Briggs, Matthew Conboy & Heather Pinson, Ryder Henry, Mary Mazziotti, Connie Merriman, Ben Schachter, Paul Schifino, Tugboat Printshop: Paul Roden & Valerie Lueth, Robert Villamagna and Larkin Werner. It's looking great in the galleries and if you plan to attend the opening reception, you can RSVP and keep tabs on who else will be there over on FaceBook. In case you'd like to help spread the word to your own online network, I've embedded an electronic flyer (complete with corresponding HTML code) below. Feel free to share this awesome Brett Yasko-designed flyer with your online community. You can also email it to the art-loving friends in your contact book. As always, thanks so much for your online support. Also opening on Saturday is Old Light, New Darkness, a collection of new works by David Beattie. Born in Northern Ireland in 1979, Beattie earned his B.A. in Fine Art from Dublin’s National College of Art and Design, and his M.A. 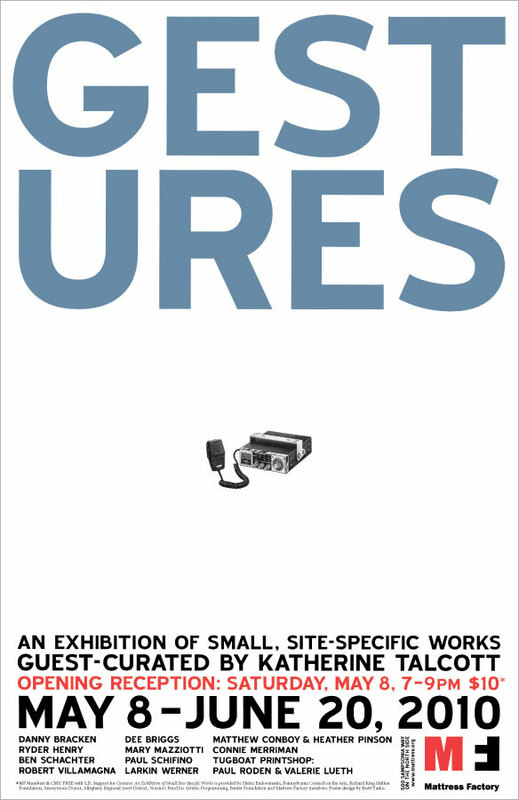 in Visual Art Practices from Dun Loaghaire Institute of Art, Design & Technology, also in Dublin. He has received a number of awards including an Arts Council Artists Bursary in 2009 and a grant from the Harpo Foundation whose mission is to support artists who are under-recognized by the field. Beattie is currently the subject of a solo exhibition at the Mercer Union Centre For Contemporary Visual Art in Toronto, Canada. Other solo shows include Butler Gallery (Kilkenny, 2009); Oonagh Young Gallery (Dublin, 2009); Mermaid Arts Centre (Bray, Co. Wicklow, 2008) and Temple Bar Gallery & Studios (Dublin, 2006).